Randy Bishop is a senior writer for Samaritan’s Purse. He recently traveled to Kenya to cover our work there. One of the great privileges of serving as a writer for Samaritan’s Purse is that I get to see what God is doing in settings around the world. When I travel, I’m encouraged to see our incredible staff meeting urgent physical needs. I also thank God as I listen to the stories of local men and women who have had their lives changed by Jesus Christ. My vision always seems to expand when I’m overseas. However, it’s rare that I can point to a specific Bible verse from a trip that keeps resonating in my spirit long after I’m home. Following my most recent journey to Africa, one verse did make a strong impression. “You are serving the Lord Christ” (Colossians 3:24b, ESV). I saw this verse informally posted in our new aircraft hangar at Eldoret International Airport. It made me curious, and I wanted to find out the backstory. I found out that it was the life verse of Jeff Graham, our director of maintenance for Mission Aviation Service in East Africa. Jeff oversees nine staff members, a mix of expatriates and Kenyans who serve as mechanics, line crewmen, and office workers. Jeff and his team are behind-the-scenes types. 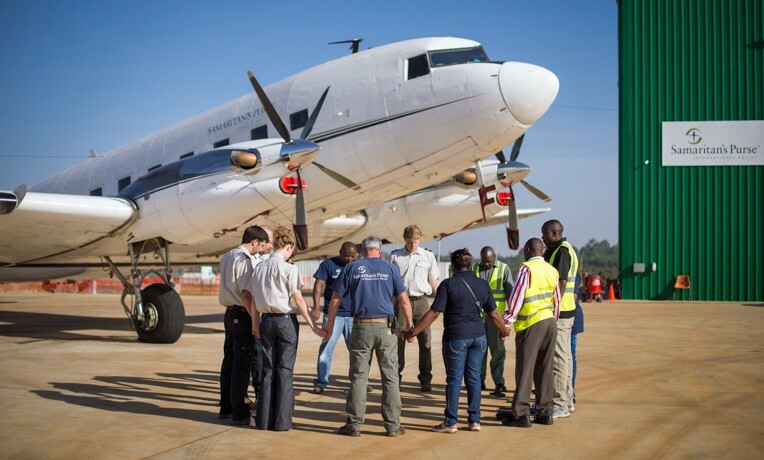 They make sure our planes and logistics are running smoothly so that the pilots can transport staff and resources to help people in desperate need. They may not get to see the people of South Sudan thank them for critical food relief, but they know they’re serving the Lord, and that’s what matters. Staff members stay busy making sure our aircraft are in top shape to deliver relief throughout the region. As he considers his work, Jeff thinks about other workers at the airport: fuel suppliers, fire department personnel, police officers, customs and immigration workers, and others. Every day is a chance to demonstrate the Gospel in word and deed. “We want to show we’re not just people working in a fancy hangar but we care,” he said. Wildred Ojwang serves as a mechanic with mission aviation services. Second, Jeff sees a ministry in how he treats his own coworkers, especially the young Kenyans he mentors. “Working with the local guys, we see them grow and mature and gain experience,” he said. Wilfred is a quick learner, growing in his job and spiritual life. Mission aviation services with Samaritan’s Purse President Franklin Graham at the March hangar dedication ceremony. As I reflect on Colossians 3:24 and the work of Jeff, Wilfred, and all the staff at Eldoret, I’m convicted and inspired. They give me something to prayerfully live up to daily. Am I walking with Christ and consciously serving Him first and foremost? Am I seeking the praise of others? Am I focused on the day-to-day or distracted by the next big trip? Do I view each day and each interaction as an opportunity to point others to Christ? How can I invest spiritually into the lives of my coworkers? My prayer today is this: Lord, help me to serve you wherever I am and whatever I’m doing.